North Korea tried and failed to hide behind the undisputed superstars of the hacker community last month when South Korea got hit by a large scale cyberattack. According to South Korea, Kim Jong Un and company worked hard to cover its tracks by hiding the IP addresses of computers used in the attacks and later destroying their hard drives. And when they got caught, they did what any dictatorial wasteland would: blame Anonymous. There are a couple of things inherently idiotic about the North's attempts to attack its neighbor undetected. For one, the date of the attack—June 25, the anniversary of the outbreak of the Korean War—is so loaded with significance it would be hard to image anyone except North Korea carrying them out. The South claims that North Korea invaded at least 69 websites, (including those of the president and prime minister), stole the data of hundreds of thousands of users and damaged servers and computers. This came after a series of attacks against banks and media outlets in March and a long line of attacks over the past few years, as tensions between the two countries remains high. The other red flag is the choice of Anonymous as a cover. 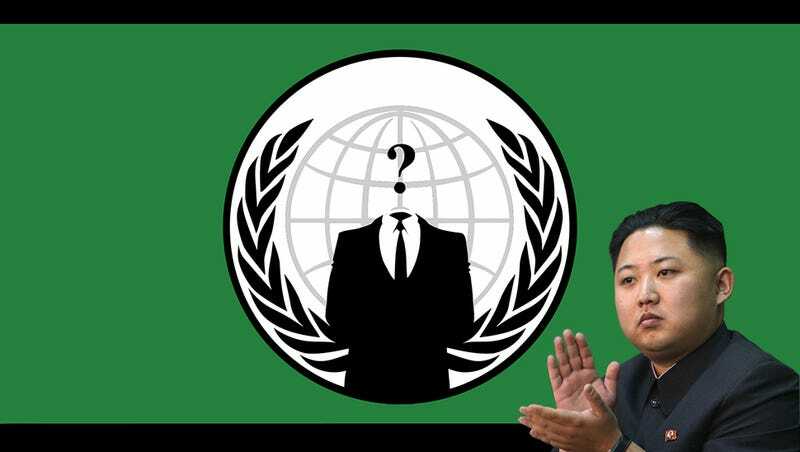 Anonymous would've been a great choice except that the hacker collective has a long history of attacking North Korea, not its southern neighbor, so a quick about face is downright confusing in this scenario. Furthermore, Anonymous has largely been lying dormant in recent months, coming out of the woodwork only for major causes. And on top of that, choosing Anonymous shows such little initiative and creativity it must be a scam. It's almost as if North Korean military leaders just Googled "hacker group" and went with the top search result. It would actually be easier for everyone involved if last month's attacks in South Korea were, in fact, Anonymous, and not the despotic regime to the north that's been threatening all-out war with the west for months now. Instead, South Korea and its allies are stuck in the strange position of not knowing what to do. It's unclear if a retaliatory cyber attack would have any real effect, for instance, since the vast majority of North Korea isn't on the internet, and an actual attack would surely escalate tensions to a deadly level. Maybe we could just take away Kim Jong Un's access to his fantasy basketball league?